Be the first to share your favorite memory, photo or story of Francoise. This memorial page is dedicated for family, friends and future generations to celebrate the life of their loved one. 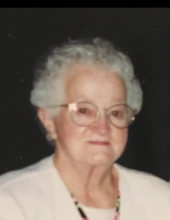 Norwich – Françoise Constance Brault, 92, of Norwich passed away peacefully on Tuesday, February 5, 2019. She was the loving wife of Paul E. Brault. Born in Woonsocket, RI, Françoise was the daughter of the late Côme and Roseanna Bergeron. She attended St. Joseph’s Grammar School and graduated from St. Clare’s High School, Class of 1944, Woonsocket, RI. After high school, she worked for Bonin Spinning Mill also in Woonsocket as a bookkeeper. On April 22, 1950 she married Paul E. Brault of Providence, RI. They made Providence their home until they settled in Taftville, CT in 1964. There they raised their five children and shared many happy family celebrations together. Françoise worked for many years as a cafeteria worker in Wequonnoc School. She was an active member of Sacred Heart Taftville’s Rosary Society and Ladies of St. Anne. Françoise liked to crochet, quilt, read and watch UCONN Women’s Basketball. Françoise is survived by her loving, devoted husband, daughters Constance Scharff (William) of Coatesville, PA; Denise Curran of Griswold, CT; Lucie Pupillo (Mark) of Norwich, CT; Anita Carrano (Michael) of Coventry, CT; and son Daniel Brault of Guilford, CT. She is also survived by ten grandchildren and six great grandchildren. Françoise was predeceased by her siblings, Leo Bergeron, Helen Guilmette and Jerome Bergeron. To plant a tree in memory of Francoise C. Brault, please visit our Tribute Store. "Email Address" would like to share the life celebration of Francoise C. Brault. Click on the "link" to go to share a favorite memory or leave a condolence message for the family.